The mosque has a dome that measures 20 meters in circumference as well as a minaret that stands 58 meters high. This largest mosque of Sabah accommodate a congregation of 17,000 people. The mosque is surrounded by lush greenery as well as flowering plants, giving it a touch of radiance. In the evenings, several eagles can be seen circling high above the mosque before making their descent onto the mosques dome. The equipment went through scheduled monthly inspections to ensure it is in good condition and functioning well to warn on tsunami emergencies. The tower was built in 2005 following the 2004 Asian tsunami triggered by a massive earthquake off Aceh, Sumatra, in Indonesia. A siren from the tower would give residents an early warning should there be an impending tsunami threat. Installed is also a closed-circuit television camera at the mosque to facilitate monitoring of the situation in the area. Besides Tawau, the Science, Technology and Innovation Ministry has also set up tsunami warning towers in Semporna, Kunak, Lahad Datu, Sandakan and Kudat. 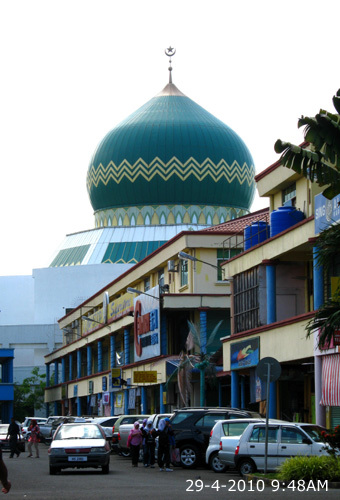 Al-Kauthar Mosque in Tawau is the largest mosque in Sabah. 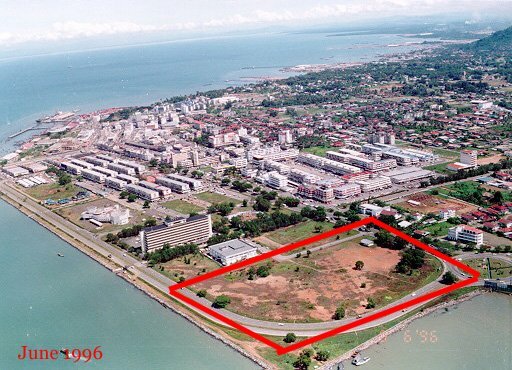 This Tawau beachfront mosque construction started on 19th June 1997, and completed in October 2002. The mosque design is a white squar building topped by a 58-m high dome with a circumference of 20m. Behind the mosque is the waterfront with good view of the sea where the merchant ships and fishing boats that sail in the Cowie Straits. In the distance view is Pulau Sebatik, an island divided between Malaysia and Indonesia. The oldest mosque of Tawau is just a 10 minutes walk across the road located along Jalan Masjid. The Yang di-Pertuan Agong Tuanku Syed Sirajuddin Tuanku Syed Putra Jamalullail, declared opened the RM31.5 million Al-Kauthar Mosque on 13th August 2004. 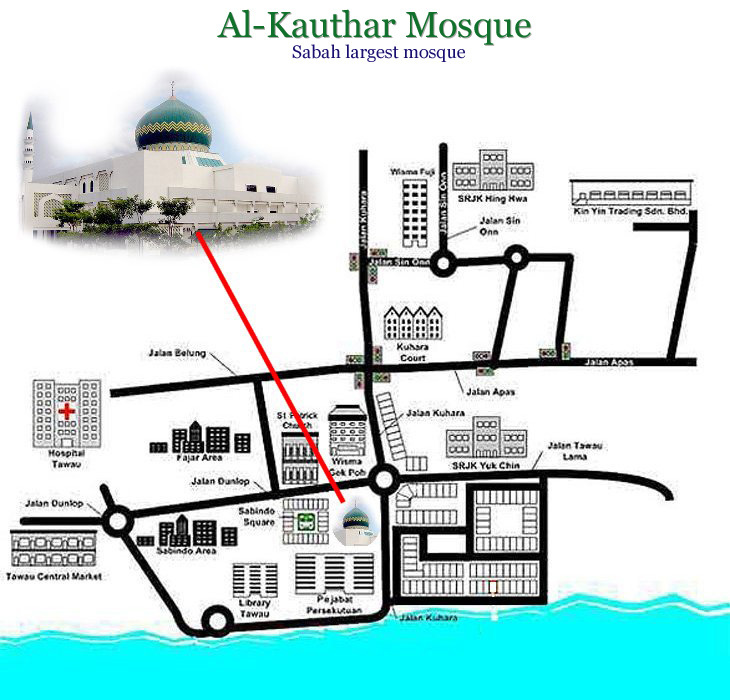 Al-Kauthar mosque can accommodate a 17,000-strong congregation at anyone time. 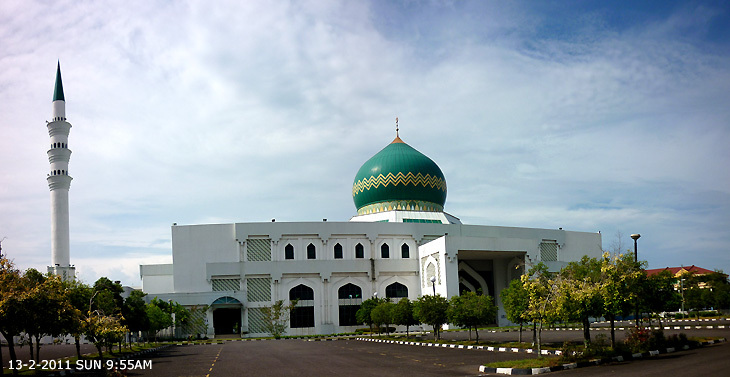 This largest mosque of Sabah completed in October 2002 is equipped with a library, a seminar hall and an administrative office. The King urged Muslims to make full use of the mosque not only to perform their daily prayers but also to seek knowledge, just like during the days of the Prophet. The King commended Sabah government for building this mosque as Sabah largest and most beautiful landmark. Balung Assemblyman Syed Abas Syed Ali is the chairman of the mosque's committee. Present on 13th August 2004 opening ceremony were Head of State Tun Ahmadshah Abdullah, Chief Minister Datuk Seri Musa Haji Aman, Deputy Chief Minister Datuk Yahya Hussin, Minister in the Chief Minister's Department Datuk Nasir Tun Sakaran, Assistant Rural Development Minister Datuk Tawfiq Abu Dakar Titingan, USIA president Tun Sakaran Dandai and MUIS president Datuk Haji Matussin Awang Damit. This new Tawau Mosque is next to the sea. Near by shops are eateries. The famous seafood stalls are 10 minutes walk from here. Before the seafood stalls is the long-distance express bus station where travellers board buses for Lahad Datu (150km away), Sandakan (360) and Kota Kinabalu (560). Few Malaysian aware that this little known Tawau Town has one of the largest mosques in Malaysia. 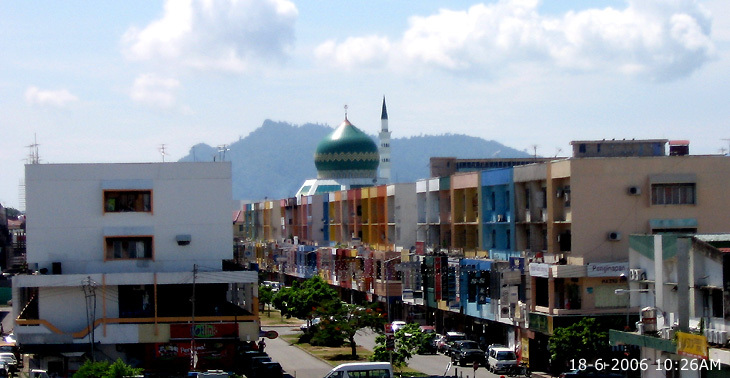 Near to the mosque is Tawau districts public library and the Federal House with offices of various government agencies. The mosque sits along the beachfront that has a popular recreational stretch known as the Traulsen Drive. Construction of the RM31.5 million Al-Kauthar Mosque began on June 19, 1997. The mosque was fully completed in October 2002 and the structure was officially opened by the then Yang di-Pertuan Agong, Tuanku Syed Sirajuddin Tuanku Syed Putra Jamalullail on Aug 13, 2004. The Al-Kauthar Mosque also boasts of having facilities for the holding of seminars apart from being equipped with an administration office, library and outlet for the sale of the paraphernalia need to perform the prayers. Tawau's Al-Kauthar Mosque is the largest in Sabah. The mosque is unique due to its vicinity to commercial centers and a public transport terminal. The mosques strategic location provides a short and easy route for Muslims from nearby business complexes and offices as well as those on leisure visits to the beach to reach it to perform their religious obligations. Looking at the buildings standing as the largest mosque in Sabah and among the biggest in Malaysia, Al-Kauthar Mosque is a tourist draw for Tawau district. The mosque vicinity to commercial centers became a landmark of the twon. The strategic location provides a short and easy route for Muslims in town to reach it to perform their religious obligations. Area in the red box is location site of Al-Kauthar Mosque before it was build. This photograph was taken 2 years before the mosque was build. The construction of the mosque was completed in October 2002. 69 MASJID BABUT TAQWA SUNGAI IMAM KG. SUNGAI IMAM, TAWAU.